Bill's OBX Beach Life: Its Been a While, However...! Its Been a While, However...! Finally, the US East Coast cold spell appears to be ending. Granted, we are not even halfway though winter yet, but these endless days of 30-something degree air temps are simply not right on the OBX! With yellow stars now appearing on the WindGuru forecast tables, its a welcome sight. Only downside is the lack of wave sailing for over a month equating to "green" conditioning for hitting the surf. Amazing the last time we had a strong, "warm" south wind was back on Dec 13! 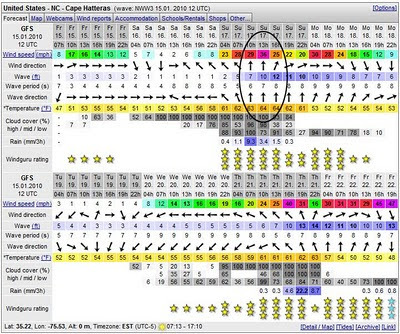 Sunday's upcoming setup looks to be perfect for Coquina Beach (see circled area on WindGuru forecast)! Strong S wind along with a S swell equals long lines and perfect waves at Coquina. Unless however, over the past month, condition of the sand bars changed there?! I will definitely be checking it out on Sunday! Only downside is water temp which is quite frigid. Definitely, full winter neoprene head to toe suit-up is necessary, even if the air temps hit the mid 60s. Conservative wave sailing is also recommended to avoid long periods in the soup, especially if separated from the rig. All in all though, I am psyched for 2010 OBX wave sailing, and look forward to my first day back in the Atlantic! PS: if you happen to be here this weekend, be sure to check into the forum for regular updates on conditions. I will report from Coquina when I see/ride it! Hope to see some others there if you are searching/need a clean DTL wave sailing fix! gonna be a fun weekend. lets compare notes on tuesday. heres Noahs forcast;Sunday: Rain and possibly a thunderstorm. High near 62. Windy, with a south wind between 21 and 31 mph. Chance of precipitation is 90%. New rainfall amounts between a half and three quarters of an inch possible. Coqunia Beach, South Nags Head SCORES Again!! Remain Calm...Even Overpowered 4.2m at the Cove!